Recently, as an impromptu gift for my culinary-inspired wife, I bought a selection of unique salts from our local Whole Foods. These are the kinds of salts that you’d find garnishing the odd dish at a fancy restaurant, not those meant to be cooked into anything or plopped into your bath. Indeed, I’ve had the red one before – a Hawaiian salt stingily dashed atop a slice of rich chocolate ganache at one of my favourite Victoria restaurants, Cafe Brio. I find salt to be such an interesting thing. I won’t call it a mineral or an ingredient, because those descriptors are too confining for its myriad applications and dynamic history. While salt truly has had a remarkable past (once traded as currency) it is how we interpret and utilize it today that really piques my curiosity. It is because salt is such a basic and simple thing, found pretty much everywhere, and it is such a staple to the existence of life on earth, yet it has become both a luxury and a tradable commodity around the world. Also, the sincere dichotomy of its application – being so intrinsically basic and yet having the ability to dramatically influence our foods. Salt also has the ability to express distinct terroir (character of place of origin) – not unlike other historic culinary marvels including water and wine. Despite being the same composition no matter where it comes from, where a salt does come from matters greatly in its unaltered appearance and flavour. Of the salts shown in this picture, there are some with large, flakey crystals and some with very fine crystals. Some are red or pink, while others are bright white. They come from as far away as the Murray River Basin in Australia, or Hawaii. Two (the brown ones) are smoked, which adds pungent, smoky, woody aromas. 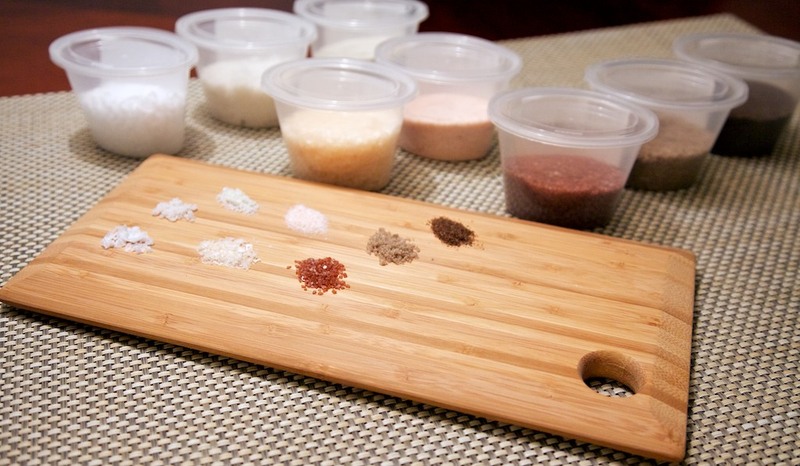 Each salt, while having its own flavour characteristics, will impart different flavours upon the foods they are added to, offering incredible opportunities for flavour differentiation in the kitchen. I’ll leave it up to my wife to tell you about each one. Keep an eye on her blog in the next few weeks while she explores the different salts before us and tries them in the kitchen. I’m excited, aren’t you? This will be a fun challenge. Heirloom tomato salad? Fancy soup? Maybe cedar plank salmon for the smoky salts?